And a name, represented by the enum member’s string name. Id – the integer value of the enum member. Name – the string name of the enum member. Value – the contained enum member. You might wonder why I didn’t bother to restrict the allowed generic Types to enums. Well, it so happens that .NET generics doesn’t allow you to restrict generic type declarations to enums. It allows you to restrict generic types to structs, and all sort of other things, but not to enums. So you will never be able to get an exact generic restriction for the Reference class. So I thought, aag what the hell, if I can’t get an exact restriction, then what’s the point anyways? I’ll have to trust that whoever is using the code, knows what he’s doing. This is not completely tidy, because to a degree the limitations of the data access infrastructure, i.e. NHibernate, force us to adopt a compromise solution that’s not necessary if we changed to something else. In other words things from the data infrastructure layers spills into the domain. The above Fluent NHibernate mapping tells NHibernate to use whatever value property Id has for the primary key, and not generate one for it. You also have to explicitly specify the table’s name you’d like NHibernate to use, because you want to ignore “Reference” as part of the table name, and only use the enum type name. And that’s it. You will now have a separate table called LoanType, with the foreign keys of other classes’ tables referencing the LoanType enum’s table. Just keep in mind that this solution might not always be feasible. For example it might not work too well when you write a multilingual application. Also should you want to get a pretty description for each enum’s member, for example “Personal Loan”, instead of “PersonalLoan” you’ll have to throw in some intelligent text parsing that split’s a text string before each uppercase character. Hopefully this post gave you another option to map your enum types with NHibernate. I won’t go into the detail of the matter, other than to say that many of these don’t give you a very clear indication as to what exactly is missing. var connectionStr = "Server=127.0.0.1;Port=5432;Database=the_db;User Id=user_name;Password=password;"
// and exports a database schema from it. TypeOfFluentNHibernateMapping is a class that inherits from FluentNHibernate.Mapping.ClassMap<T>. This tells Fluent to load all ClassMappings from the assembly where this type is defined. BuildSchema(…) creates the database’s schema based on the specified mapping configuration and recreates the tables and the rest of it in the database specified by the connection string. I included the call to the schema export’s drop method, because the code originates from my unit tests, where I drop & recreate the database on each test run. 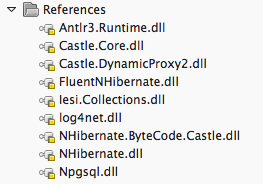 So far I like Fluent NHibernate, and the only complaint I have so far is the way NHibernate (not Fluent) handles enums. It assumes you want to use the enum member’s string name. The way I like to store my enums, are to have a separate table for them.